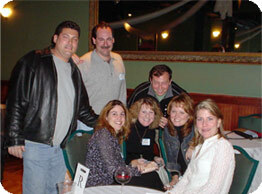 Our Connecticut Singles Events are a fantastic resource that allows you to meet new individuals. Perhaps you just want to date, or maybe you would like to find your soul mate. Regardless of what you are looking for, our Singles CT events take place in relaxed environments, so you will feel at ease with just being yourself. Our events are based on different age brackets and the participants must show id, verifying age. We do not believe it is right to promote one bracket and give something else. Participants make a reservation in advance and pre pay to make sure the gender balance is pretty equal. Speed Dating: CT Singles will have up to 12 dates during the evening, , each lasts approximately 4-6 mins. After each round, you'll will circle yes or no on the card provided to you. This will indicate if you would interested in keeping in touch with that person afterwards. When the event ends, you'll hand in your scorecard for us to tally. The following day, you will get an email with your results. The email provides you with the person's first name and email and they get yours (if you mutually matched). We also let you know one way matches (they picked you, but you didn't pick them), in case you have a change of heart. Thus far 75-85 percent of attendees leave the with at least one match ( you picked them and they picked you). "This is awesome! I might have stared at a man all night in a club, and never got the chance to speak to him. This forces you to interact." Other Speed Events: In the future, we will have additional speed events, including speed bowling, speed cooking, speed rock climbing and much more. They integrate a rotation aspect so that you will spend a certain period with someone, and then meet people from the next group. Non Structured Events: We will also have non speed dating events events such as Barbques , games, comedy clubs, and more . Contact us now at (203) 429-4591 with any questions.